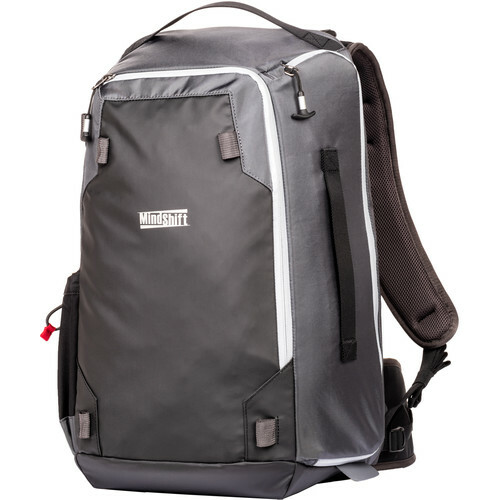 The carbon gray PhotoCross 15 Backpack from MindShift Gear is a camera bag that can hold a medium-sized DSLR along with three to five lenses, including a 70-200mm f/2.8 lens. Built to fit snugly against the body, the PhotoCross 15 is designed to be rotated from one's back to front for easy reach into its camera compartment. Access to the camera compartment is then provided by a top-facing zippered panel with a 180° upward opening. Along the inside of that zippered panel are two zippered, mesh organizational pockets which can be used to store and organize camera batteries, memory cards, or small electronics. Within the camera compartment and towards the side of the backpack that rests against the wearer is a slip pocket with room for a 15" laptop computer, while five adjustable and removable dividers allow that compartment's space to be configured according to the specific camera equipment placed inside. Also accessible when the PhotoCross 15 is rotated from back to front is the backpack's front panel which unzips to reveal a convenient space for books, notepads, snacks, or packable clothing; plus a slip pocket for a 10" tablet computer. Like the camera compartment zipper, the front panel zipper includes a large, T-shaped pull that can be easily gripped even in wet or cold weather conditions. In addition to being worn as a backpack, the PhotoCross 15 can be carried using its built-in top handle or its built-in side handle. For an enhanced fit, a removable waist belt is included. The waist belt serves to transfer weight from the shoulders to the hips for additional comfort, while a sternum strap further limits unintentional shifting around the wearer when traveling over rough or uneven terrain. The shoulder straps and waist belt feature a resilient, breathable 3D mesh padding which cushions the wearer with an elevated structure that optimizes air circulation, minimizing perspiration in warm and hot environments. There is a large stretchable side pocket that can hold a 1L water bottle, which can be secured using the cord lock on the pocket rim. Featuring durable nylon and polyester construction, the PhotoCross 15 is built to be weather resistant and includes a seam-sealed cover for use under heavy rain. Six gear loops along the surface of the backpack allow for extra items to be clipped or tied to the PhotoCross 15. One pair of gear loops is located above the stretchable side pocket, and two pairs of gear loops parallel each other on both sides of the front panel along its top and bottom. Dual compression straps are provided and can be clipped onto the gear loops, so they cross the front panel, allowing larger items such as a tripod, monopod, trekking pole, or folded apparel to be fastened against the PhotoCross 15. The stretchable side pocket can also be used to hold a tripod, monopod, or trekking pole; any of which can be secured under one of the included compression straps affixed to the gear loops positioned above the side pocket. Box Dimensions (LxWxH) 19.8 x 13.2 x 9.6"